Back in 2017, Acebeam let us took a glimpse of their upcoming ultrabright X70 sunlight, I mean search light. The first lumen monster with 3 built-in cooling fans produced by Acebeam. 3 fans? How else can you keep this flashlight cooled? Well, that was their idea. Also check out the new 52,000 lumen Imalent MS12. Update October 2018: the built-in fans seem to be unrealistic? The fan is now built into the handle, running of a single 18650 cell to cool the light. 3 built-in cooling fans//// maybe not. just 1 cooling fan inside the handle. After the Acebeam X60M touching the 10,000 lumens back in 2014, the fight for the most lumens hasn't stopped yet. Now 4 years later we are touching the 40,000 lumens 60,0000 lumens with a flashlight. Who knows when we will be touching the 100,000 lumens? 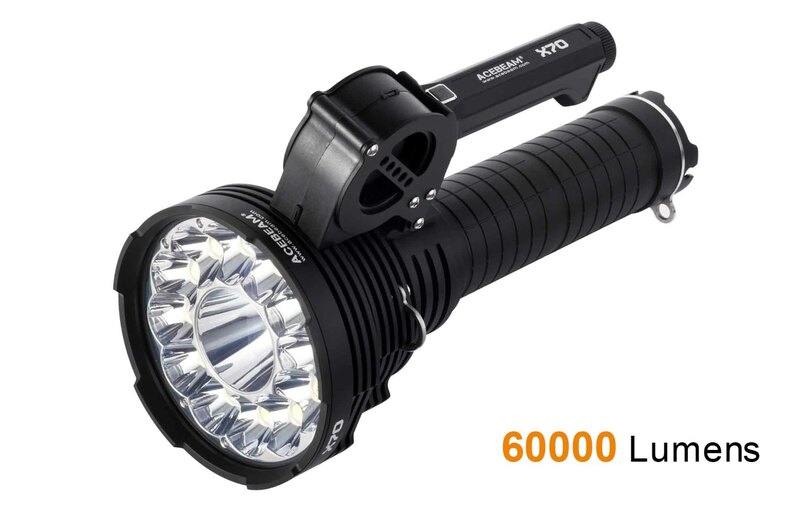 Acebeam now claims a max output of 60,000 lumens.. yes, you read that correctly, 60,000 lumens.